With the reveal of Battlefield™ V, exciting times lie ahead for Battlefield players. As you get ready for the release in October, we have prepared several stages of the Road to Battlefield V.
Let’s start with Battlefield 1. The expansion we’re giving out is Battlefield 1 In the Name of the Tsar, which lets you join the ranks of the largest mobilized army that entered World War 1 — the Russian Empire — on the war’s biggest front, as represented across six large maps. 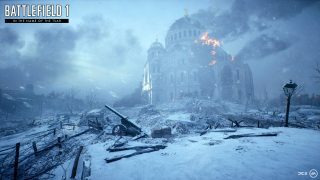 Lace your winter boots as the next stage on the road to Battlefield V takes you to the popular Tsaritsyn and Albion maps — two stylistically different experiences of the freezing Eastern Front. Defend against the German infantry as they invade the Baltic peninsula in Albion. And choose sides in the Russian civil war as either the Red or White Army on the scarred streets of Tsaritsyn. The expansion also introduced the Supply Drop game mode, shipped 11 Russian-themed weapons, and allowed players of the Scout class to plays as the Russian Empire’s formidable Women’s Battalion of Death. Head over to the Battlefield 1 In the Name of the Tsar page for a full breakdown. Don’t forget that the offer ends on May 29, 2018 and requires the Battlefield 1 base game. For those who can’t get enough snow in their Battlefield games, we are also giving away the Battlefield 4 Final Stand expansion for free* to owners of Battlefield 4, until May 29, 2018. Where Battlefield 4 Dragon’s Teeth closed the world around you in close-quarter firefights, the four large wintry maps available in Battlefield 4 Final Stand encourage vehicular engagements and careful approaches. As part of the Road to Battlefield V, you’ll find a new menu when logging into Battlefield 1, with a list of daily tasks that will go toward earning various rewards. The available rewards unlock weekly and can be earned during that particular time period. This week’s items include the merciless Barbed Wire Bat melee weapon and a Squad XP Boost. Players with a Battlefield 1 Premium Pass can earn the Legendary hunter weapon skin La Grand Griffon for the M1909 Benét-Mercié and support their squad with a Midas touch. Get ready to deploy – pre-order Battlefield V.
More detailed info will be available soon on what you can earn for Battlefield V, but expect exclusive weapon skins, Soldier Sets, and other exciting items as we approach the October launch. Play the free* expansions and complete missions as we pave the way on the road to Battlefield V.
*THIS OFFER IS BEING ISSUED TO YOU FOR PROMOTIONAL PURPOSES ONLY AND DOES NOT HAVE A CASH VALUE. OFFER EXPIRES MAY 29, 2018. VALID FOR NEW DOWNLOADS OF BATTLEFIELD 1 IN THE NAME OF TSAR AND BATTLEFIELD 4 DRAGON’S TEETH (EACH, A "PRODUCT") ONLY FROM THE ORIGIN STORE (origin.com), WITHIN THE ORIGIN CLIENT SOFTWARE (origin.com/about), FROM THE PLAYSTATION STORE, OR FROM XBOX MARKETPLACE. BATTLEFIELD 1 FOR APPLICABLE PLATFORM (SOLD SEPARATELY) REQUIRED FOR BATTLEFIELD 1 IN THE NAME OF THE TSAR OFFER. BATTLEFIELD 4 FOR APPLICABLE PLATFORM (SOLD SEPARATELY) REQUIRED FOR BATTLEFIELD 4 DRAGON’S TEETH OFFER. FOR PLAYSTATION 4, A PLAYSTATION PLUS ACCOUNT (SOLD SEPARATELY) MAY BE REQUIRED IN SOME LOCATIONS. VALID WHEREVER PRODUCT IS SOLD. LIMIT ONE OFFER PER PERSON. MAY NOT BE COMBINED WITH ANY OTHER PROMOTIONAL OR DISCOUNT OFFER, UNLESS EXPRESSLY AUTHORIZED BY EA; MAY NOT BE COMBINED WITH ANY PREPAID CARD REDEEMABLE FOR THE APPLICABLE CONTENT. CUSTOMERS ARE RESPONSIBLE FOR APPLICABLE SALES TAX. OFFER MAY NOT BE SUBSTITUTED, EXCHANGED, SOLD OR REDEEMED FOR CASH OR OTHER GOODS OR SERVICES. VOID WHERE PROHIBITED, TAXED OR RESTRICTED BY LAW. **REQUIRES BATTLEFIELD 1 OR BATTLEFIELD V ON APPLICABLE PLATFORM (SOLD SEPARATELY), INTERNET CONNECTION, EA ACCOUNT, AND, FOR CONSOLE PLAYERS, AN XBOX LIVE GOLD OR PLAYSTATION PLUS ACCOUNT (EACH SOLD SEPARATELY). YOU MUST LOG INTO BATTLEFIELD 4, BATTLEFIELD 1 OR BATTLEFIELD V WITH THE SAME EA ACCOUNT USED TO EARN THE REWARDS.